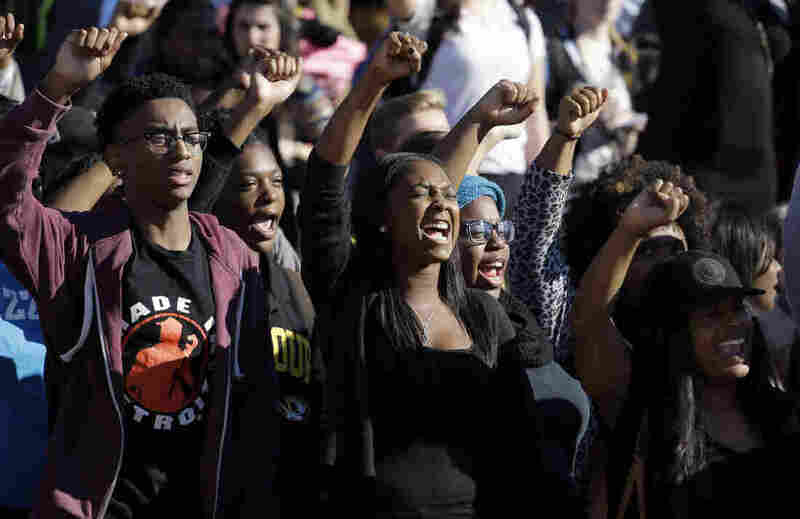 With Campus Racism, How Can College Presidents Get It Right? : NPR Ed The resignation of the head of the University of Missouri System raises an important question: How should he have responded? Students cheer while listening to protesters, following the announcement that Tim Wolfe, the president of the University of Missouri System, would resign. Tim Wolfe is not the first college administrator to come under fire for responding poorly to campus racism. And Wolfe, until this week the head of the University of Missouri System, isn't likely to be the last. College presidents who have themselves been in crisis have learned there's a right way — and a wrong way — to respond. Case in point: Wolfe's response to concerns over racism was quickly held up as an example of what not to do. Ultimately it led to his departure. "It's not clear if the University of Missouri responded either quickly or empathetically enough," says Terry Hartle, senior vice president of the American Council on Education, which represents around 1,800 university presidents. Hartle says you can't prevent racism. "There's no law that says you can't be an idiot," says Hartle. The important thing is how the administration responds. "Any college president, when confronted by a crisis, needs to respond quickly, empathetically and to get it right," he says. Mary Sue Coleman, the former president of the University of Michigan, faced her own crisis in 2013: Black students raised concerns that they did not feel welcome or safe on campus. The movement took flight as #BBUM, or Being Black at the University of Michigan, with students posting testimonials on Twitter and YouTube. "It was very painful for us to watch but immediately we responded," says Coleman, who added that she and other administrators met with students and put together a "task force" on the issue. Coleman retired a year later. She stayed long enough to put changes in place, and now she's had time to reflect on the movement and how she handled it. The most important thing, she says, was to respond with empathy. "We worked on the issues students raised, because it was important for us to listen to what they were experiencing," she says. But that's not how Robert Greenfield, a senior engineering major and member of the school's black student union, remembers it. Greenfield says the university waited months before addressing their concerns. Black students had described being subjected to racist insults and targeted by campus police and white fraternities. He described people at parties in blackface, carrying watermelons and wearing dreads. Although Greenfield says he wishes the response had been faster, he acknowledges that the university has met most of the demands. And he says black students didn't expect the university to eliminate campus racism overnight: "When you talk to the administration, it's more about politics than anything else." In meetings with school officials, for example, students demanded a long-term plan to raise black student enrollment to 10 percent. It's at about 4 percent this year. They also wanted the school to help students who are struggling financially, and to provide better transportation to affordable housing. Despite the progress, Greenfield says that officials could still be doing more to help black students feel welcome. "In my experience, students understand that you can't fix everything. That's not what they expect, but they expect people to listen," she says. "It's hard work that never ends."